Professional development has most impact when it focuses on empowering teachers to take ownership, and occurs locally and in context. Use video to more efficiently, and cost-effectively help teachers achieve their individual professional learning goals. Boost teachers development with highly personalized mentoring and coaching. Conduct more meaningful coaching, observations, and evaluations. Make self-reflections easier for teachers. Have more effective use of video in PLC meetings. Provide teachers with mechanism to more efficiently get feedback from their peers. Remotely coach teachers saving you time and money. Did you know you're exactly the type of person we want to support – the reason why Vosaic was created? We're super excited to help you get started. Here's a toolkit we wrote to help you get the juices flowing. Observe teachers using Danielson's, Marzano, CLASS, or any other framework. Build trust and rapport with teachers. Personalize professional development to fit individual teacher needs. Help develop a community of reflective teachers. Conduct more meaningful observations and evaluations. Help teachers take more responsibility for their own professional development. Build up a library of best practice videos. Encourage the development of an open and collaborative culture of learning. "Vosaic allows teachers to focus in on what they'd like to improve in their teaching. As an instructional coach it's really easy for me to create a feedback form that focuses on their goals, and then choose that form to mark up their video at the time of their recording." According to the U.S. Department of Education: "States and districts may use Title II, Part A funds to create personalized digital learning opportunities for teachers, instructional leadership teams, principals, or other school leaders, and thereby move away from one-size-fits-all professional development." 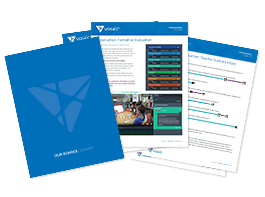 As an evidence-based, digital technology that focuses on meeting individual professional development needs, Vosaic may qualify for Title II-A ESSA funds at your state. Consult with your LEA about using Title II-A funds for Vosaic, or if you're a FACTS customer, with a FACTS Educations Solutions representative. Record videos of themselves using the Vosaic iOS app or any other camera. Privately upload videos for self-reflection. Add comments to important moments. Share videos they like the best with a principal, coach, or peer for feedback. Reflect and improve with marked-up video using predefined evaluation forms and timestamped comments. You can easily set up Vosaic to fit individual teacher, school, and district needs. Whether using Marzano, Danielson's, CLASS, or another observation, evaluation, or coaching framework, Vosaic's custom feedback forms help principals, coaches, and teachers, observe, coach, evaluate, and self-reflect in a way that makes most sense to them. "When using Vosaic Connect to review video later in my office rather than text documentation, I found my that my text documentation was filled with biases. I only documented when I saw the things I was looking for. I missed many activities while documenting." Getting Started With Video Toolkit (PDF). Oops, something went wrong. Can you please try again? All fields are required. Thank you.